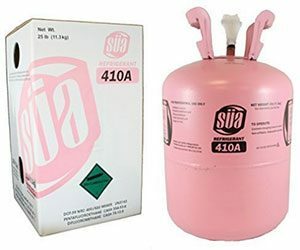 All of our new Air Conditioners & Heat Pumps use R-410A refrigerant! Some Air Conditioners and Heat Pumps sold around the world used a refrigerant called R-22. According to experts, R-22 Emissions damage our environment, because they lead to depleting the ozone layer. The ozone layer protects animals and people from harmful rays from the sun. You can make a difference and can now purchase an Air Conditioner or Heat Pump for your home or office that uses the environmentally friendlier R-410A refrigerant. R-410A is also more efficient than R-22 refrigerant. So, investing in a equipment that uses R-410A will last you for many years to come. Why Switch to a R-410A System? R-410A systems are more reliable than those that use R-22 because R-410A systems are heavier-duty, with a thicker compressor shell. Generally R-410A equipment is smaller, sturdier and vibrate less. That means, less leaks, and noises. In addition the manufacturers of R-410A equipment require technicians to be fully trained on R-410A before they can sell or service that manufacturer’s R-410A equipment. So dealers and technicians that install and service R-410A systems are better trained and have all the tools to give you a more reliable installation. R-410A refrigerant is cheaper than R-22 refrigerant. According to studies equipment that uses R-410A are possibly safer than systems that contain R-22. R-22 production is being reduced and will be phased out globally. The plants that make R-22 will eventually be shut down or start making other chemicals. 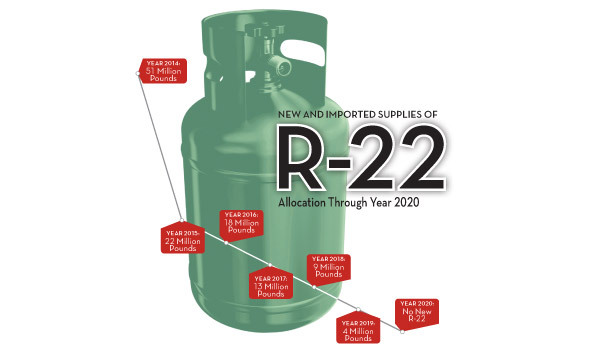 In 2015, the cap on R-22 and other ozone-depleting refrigerants was reduced to allow a maximum of about 60 million pounds of new R-22 to be produced in or imported into the U.S. 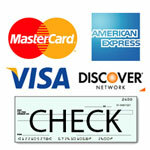 Currently, the U.S. uses over 160 million pounds each year! 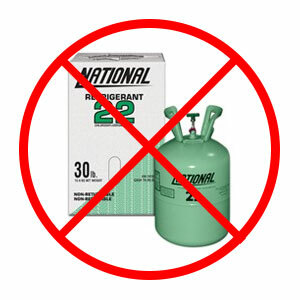 The EPA phase out of R-22 refrigerant production beginning Jan 1, 2015 and ending in the year 2020. The U.S. Department of Energy will require a increases in the minimum efficiency of new home central air conditioners. Air conditioner manufacturers have to find ways to increase the efficiency of their air conditioners. One way is to use a more efficient refrigerant, such as R-410A refrigerant as it is at least 5% more efficient than R-22. Major equipment manufacturers in the United States selected R-410A as their choice to replace R-22 in new equipment. And, every major manufacturer in the U.S. now offers a R-410A brand. Since the reliability of R-410A equipment is significantly better than R-22 equipment , R-410A is now the HVAC industry standard. Since 1995 Air Conditioners and Heat Pumps using R-410A have been available in the U.S. The Filter Drier – Almost all equipment that uses R-410A have a device that filters, cleans, and dries the refrigerant and oil as it circulates through your system just like an oil filter would in your car. The Filter Drier is an important reason why air conditioners with R-410A are considered by manufacturers to be the most reliable products they make.